Thanks to the political opportunism of the current Commander-in-Chief, the Afghanistan war is still without end or logical purpose. 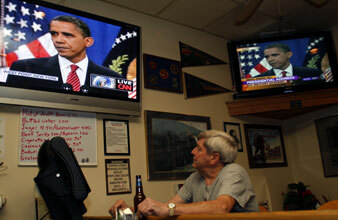 Veteran Al Miller watches President Obama speaks about the war on Afghanistan at the VFW Post 3513 in Scottsdale, Arizona. It is already a thirty-year war begun by one Democratic president, and thanks to the political opportunism of the current Commander-in-Chief the Afghanistan war is still without end or logical purpose. President Barack Obama’s own top national security adviser has stated that there are fewer than 100 Al Qaeda members in Afghanistan and that they are not capable of launching attacks. What superheroes they must be, then, to require 100,000 US troops to contain them.